My Windows Phone 7 phone arrived this week in the form of the HTC 7 Trophy. After the joy of iPhone 4 and the unexpected sluggishness of my HTC Desire HD, how would the new phone stack up - and how easy is it to develop for? In this image Nick holds his HTC 7 Trophy Window Phone 7 handset. Firstly, the phone was easy to set up. It downloaded all the appropriate cellular settings (such as voicemail number and data connection info) from my cellular network, 3, quickly. Then it was a case of linking to my Windows Live ID / XBox Live account which I have had setup for my Xbox previously. Next, the phone's setup wizard guided me through linking to my various email accounts and associated contacts lists, which updated speedily. Linking to Facebook was just as swift - and afterwards many of my contacts had images just as they had before on the Android phone. The WP7 then amalgamated all my contact/friend information into a 'People' app which is easy to use and joins up Facebook comments to contact phone numbers. The linking worked well. I could take individual people I contact regularly and pin them to the home page to form their own square for quick access. The 'home page' of the phone is a series of boxes - mostly square but some rectangular - that act as mini-screens for the apps they represent. It was easy to move the squares around, unpin them, and pin other apps from the list. The squares themselves are rarely static, instead sliding up images of friends, email counts or the weather symbol and temperature. I noticed how speedily the phone operated, with smooth graphics and a sure-footedness when finger-swiping that was often lacking on the two android phones I have owned (Google Nexus One and HTC Desire HD). By this I mean that on the android phones, I would often have to swipe twice or more to get an icon to move to operate a function. I did wonder if this was HTC hardware, but I have never yet experienced this problem on this HTC 7 Trophy phone, so I'm focussing the problem towards android itself. Even more interesting is how sensitive this phone is to mobile signals (from the 3 network) compared to my HTC Desire HD. Not only are the signal strength bars reading stronger but I can use the 3 network throughout my house whereas the Desire only works upstairs - and poorly at that. If Apple iPhone 'insists' on the presence of iTunes, then the WP7 'desires' (not insists on) the presence of Zune, Microsoft's equivalent media syncing application. 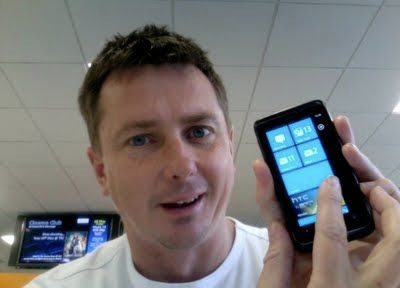 Unlike iPhone, the WP7 phone works straight out of the box once you install a SIM, whereas the iPhone has the stark 'connect me to iTunes' graphic and is locked until you do so. However, like iPhone (but unlike Android) the WP7 phone cannot perform its own system updates unaided. I am impressed how Android can perform its own updates. I needed to update WP7 twice using Zune - a short February update and and a very long March update, the latter which took the phone out of use for over 30 minutes. However it was worth it for the copy & paste capability that then appeared. This morning another update arrived, which took about 10 minutes to complete. As we know, there are a lack of apps in the Zune Marketplace at the moment, although the ones I use a lot such as eBay, Twitter and Kindle were present - oh and two Tesco apps of course! The apps that are there are useful - such as the London tube network journey planner. More apps will come (and I will help by developing myself!) - time will resolve this problem. So to development: Oh wonderful! A download of the Windows 7 development tools and then into Visual Studio 2010 and my beloved C# programming language. Not the hugely cut down .Net Compact Framework either but a really big subset of the full Framework. So a spot of C#, a smattering of easy Silverlight XAML, 2 minutes and I had an interactive app running in the WP7 emulator phone. Five more minutes and £65 poorer, I had joined the Microsoft App Hub application development portal which, on activation, will unlock my phone so I can test apps directly on it (much like the iPhone development system). I did wonder if Windows Phone 7 could match iPhone and I declare them equal apart from the app count - and no need to develop using a low-down and frustrating programming language such as Apple's Objective-C - thus my "unexpected joy". I also see clearly that Android seems to need more power than the same hardware affords it compared to the other phones. So Windows Phone 7 is a hit with me and this phone is now my primary handset - that's saying something. Well done, Microsoft; well done! "this phone is now my primary handset - that's saying something"
What I've mainly given up on is the frustration of using my android phone with its unresponsiveness now I have seen iPhone and and WP7 in action (the latter on essentially the same hardware). However, if you are referring to our forthcoming groceries app for android - I've just this week invested in nearly every model of android handset so the test team can engage in their work to thoroughly test the app across all android capabilities and screen sizes/shapes. Home straight, my friend; home straight! My Desire HD is anything but sluggish - though you have to give it time, as it builds up a picture of your most used apps. The most important thing is that you don't use any task killer apps, as the Android OS can't then build up a true picture of the apps you're using the most. I have a windows phone 7 which i also think is superb, and will be even more so when the next update arrives, now all that we need to happen is for Tesco to start selling windows phone 7 handsets, as they have been strangely missing for months now, when they offer one my wife will buy one !! Romford going well, off on holiday now!